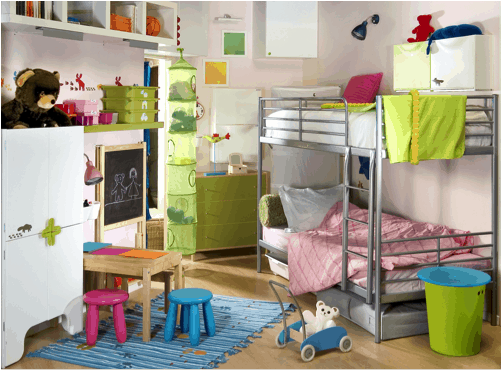 When you think about remodeling your kid’s room, you think about colors, furniture, and accessories. The element that makes everything look fabulous is lighting, and it’s an element that’s often overlooked. With a combination of overhead lighting for the whole room and area lighting for displays and activity centers, you’ll transform your child’s room from a humdrum toy catch-all into a glorious, welcoming playland. Ambient (overhead) light in a room can come from large, central fixtures. Use a ceiling fan with an attractive light fixture to efficiently circulate cool and warm air throughout the room. If you want a decorative fan, choose decorated blades, but avoid light fixtures that are frosted with dark colors; they’ll make it tough to cast enough light over the room. If you don’t use ceiling fans, choose a central fixture that’s bright enough to allow your child to see properly. Additional ambient lighting can come from sources other than your central fixture. Remember that you might want to rearrange the room later, so only install permanent fixtures where you’ll always have use for them. Try adding overhead recessed lighting to illuminate task areas or an industrial track lighting fixture to highlight your child’s artwork. Hang a pendant light over a round worktable, an easel, or your child’s miniature kitchen. Choose lampshades and lamp bases that double as decorative accents for your child’s room. Use a shade that incorporates one of your accent colors on a chest of drawers. On the nightstand, choose a fun base that matches the theme of your room or one of your child’s favorite animals. Tuck a floor lamp behind a comfy chair to create a reading station in one corner of your older child’s room. 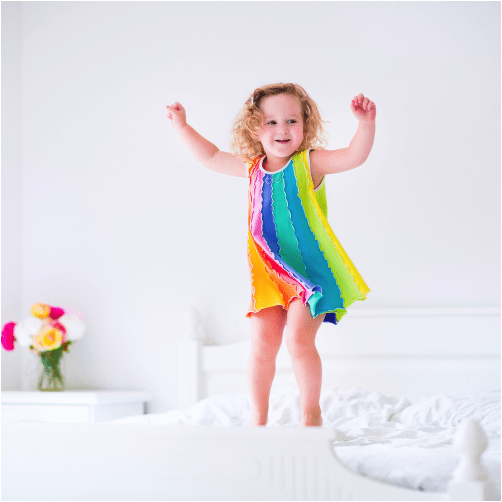 In a young child’s room, avoid floor lamps; they’re too easy to tip over. When designers talk about warm lighting versus cool lighting, they aren’t talking about how much heat a bulb puts out. They’re talking about a concept called color temperature, which describes the light’s color quality. Warm light tends to be more yellow or even slightly pink while cool light looks more white or blue. As a rule of thumb, use warm light in bedrooms for ambient light, but use cooler lighting for highly visual tasks, such as reading and doing homework. LED lights are more expensive than incandescent bulbs, but they have an incredibly long lifespan. Thanks to new LED technology, they offer color quality similar to incandescents. When you’re choosing LED lights, choose bulbs labeled “warm white” or “soft white” for lighting reminiscent of an incandescent bulb. Also, ignore watts when you purchase LED lights; a 12-watt LED light puts out as much brightness as a 60-watt incandescent light. Instead, look for a measurement called lumens, which more accurately represents how much light a bulb gives off. For LED bulbs, a measurement of 800 lumens produces the brightness of a 60-watt incandescent bulb while 1600 lumens approximates a 100-watt bulb. · Lamps. Choose lamps with sturdy bases that aren’t easy to knock over. Also, make sure they’re easy for your child to turn off and on without putting their fingers too close to a hot bulb. Look for the UL seal, which shows that the lamp has been tested and is safe. · Bulbs. Avoid using halogen bulbs in a child’s room because they burn extremely hot. Also, avoid using high-watt bulbs in closed fixtures because the fixtures can get hot and burn your child’s hand. · Cords. Replace any frayed or exposed cords or wrap them securely in electrical tape. To avoid tripping hazards, gather cords together using cord control kits, and tuck them safely behind the furniture when possible. · Outlets. Always use outlet covers to cover any plug-ins that you’re not using, whether for lighting or another purpose. This rule goes for both wall outlets and power strip outlets. · Disposal. When LED bulbs reach the end of their lives, place them in a plastic resealable bag and return them to your local home improvement store. Many stores, including Home Depot, will recycle them at no charge. Don’t let the perfect colors, furniture, and accessories you’ve chosen for your child’s room look drab instead of dazzling. Great lighting is the ingredient that makes everything come together.